This may have been a pub in an earlier life, it certainly looks like it. 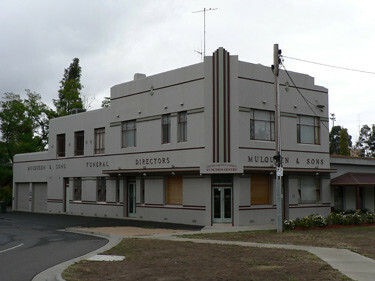 It is currently the Function Centre for the Mulqueen Family Funeral Directors. These funeral directors have been in business since 1853 and took on the name Mulqueen & Sons in 1934 so they may have built this great looking Art Deco building for their own use but it really does look like a pub to me. Some of the windows and the side doors bear a wonderful geometric frosted glass design. This snap from the back of a cab in Kenya's capital Nairobi shows a tantalising glimpse of an Art Deco building. By the looks of it, a small scale skyscraper, maybe 10 storeys tall. I wish I knew more. I wish I had got the chance to go back and explore it some more. 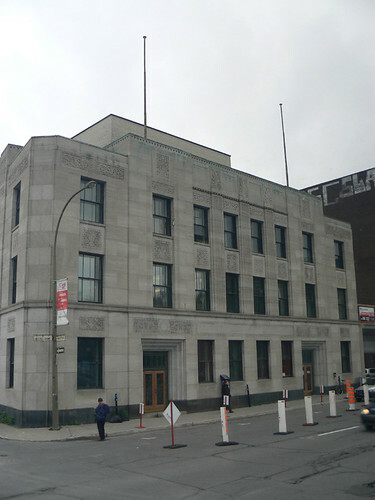 The Art Deco Montreal website has a comprehensive list of Art Deco buildings in chronological order. This building, National Breweries by architect Harold Lea Fetherstonhaugh is listed for the year 1931. 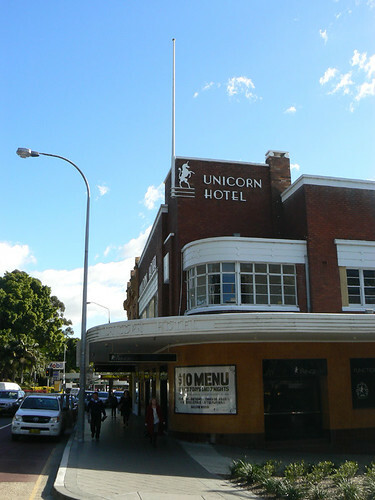 The Unicorn Hotel in Oxford St, Paddington is another typical Sydney streamline brick pub. I especially like the unicorn and the rule of three supports at the base of the flagpole. 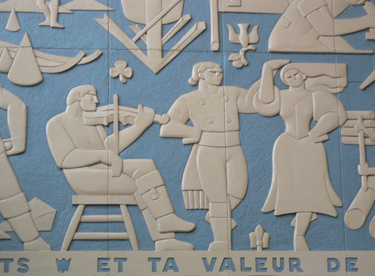 I am really enjoying looking at the various details in the Art Deco friezes by Charles Comfort at Montreal's Gare Central. 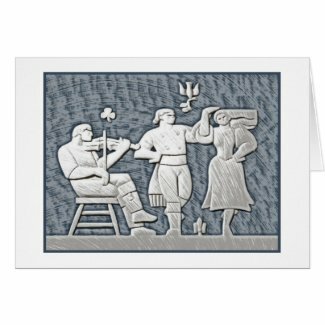 The other day I posted some of the sports that are represented among the scenes of Canadian life. Today I have zoomed in on some folk dancers and the accompanying fiddler. The way the woman's hair has been stylised into a horizontal wave is a common deco technique but it one of which I never tire. I love the severe straight line Confort has used for the top of her hair. 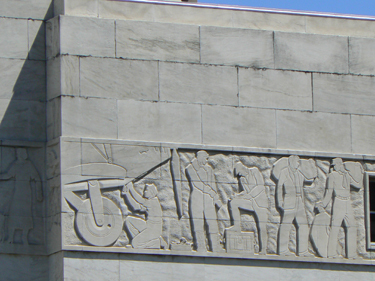 This portion of the frieze also shows some of the other symbols and motifs that are included in the overall confusion of the scenes. Above the dancers there is a dove carrying a branch which could symbolise peace or Noah's deliverance from the flood or both. There is also a shamrock above the fiddler and a fleur de lis between the dancers. 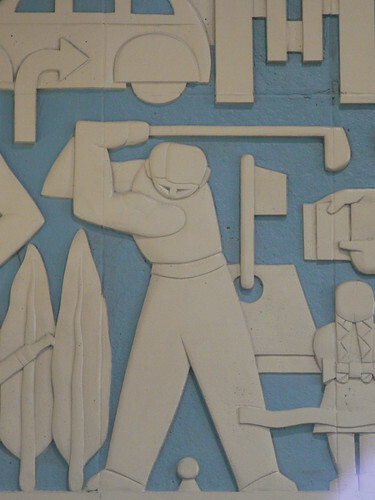 These and other symbols elsewhere in the friezes represent the peoples who have emigrated to Canada. Below this panel some of the words of the Canadian National Anthem can be seen. In this case they are in French. At the other end of the ticketing hall the National Anthem is in English. I like these scenes so much, I've isolated the detail and created some designs on Zazzle. I think they look great. The Saltdean Lido was designed by architect R H W Jones and was opened in 1938. Saltdean and Rottingdean Local Historian, Douglas d'Enno, author of The Saltdean Story has provided some wonderful information for the www.saltdean.info website. 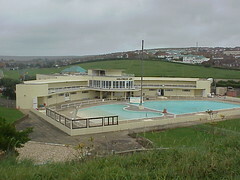 The site includes historic photos of the lido and details of Saltdean during the pre-War period. d'Enno draws comparisons between the Saltdean Lido and the 1935 De La Warr Pavilion in Bexhill-on-Sea. There are certainly common elements. Lidos were very popular in the UK during the 1920s and 30s but now many have survived into the 21st Century. It is nice to see Saltdean Lido is one of the rare survivors. 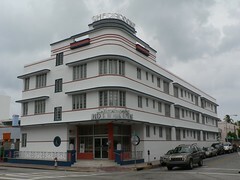 The Sherbrooke Hotel on the corner of Collins Avenue and 9th Street in Miami South Beach is a fine example of streamline design. It was constructed quite late, post WWII, 1947. The architects were MacKay and Gibbs. 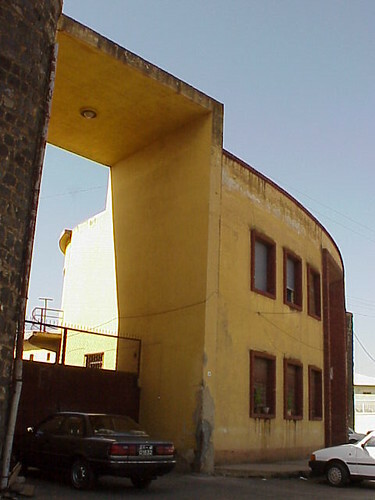 It is a building as a ship, the corner parapet acting as a bridge. There is even a couple of portholes, one each side of the main entrance. 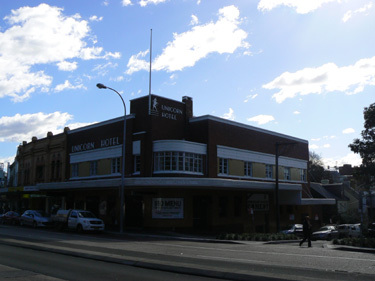 Often streamline buildings have regular, horizontal bands of windows but the Sherbrooke Hotel has an unusual arrangement of different sized windows. As is often the case in sunny climates concrete eyebrows provide shading for the windows. 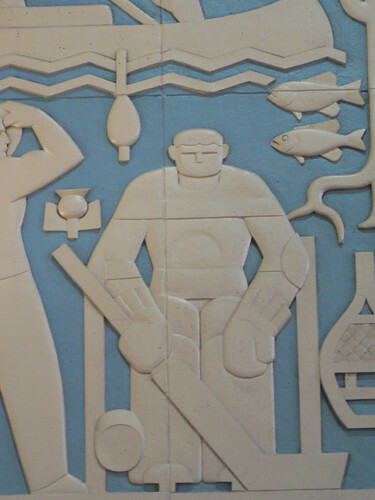 The Gare Centrale in Montreal was designed by J Campbell Merrett and opened in 1943. 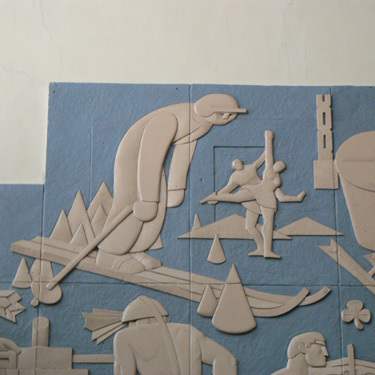 The ends of the ticket hall bear large blue and white murals by Charles Comfort depicting all aspects of Canadian life. 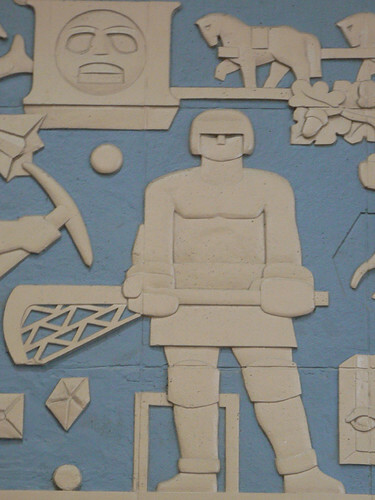 Today I've picked out some sports that are included such as Ice Hockey (above). 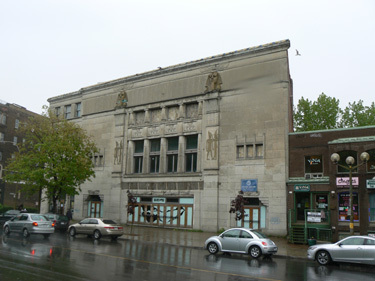 The Empress Theatre was not part of any of the tours during the 10th World Congress on Art Deco in Montreal in May 2009 but it was mentioned during Dane Lanken's presentation on Montreal Movie Palaces. Despite the rain I was glad I was able to make my own way out to see it. 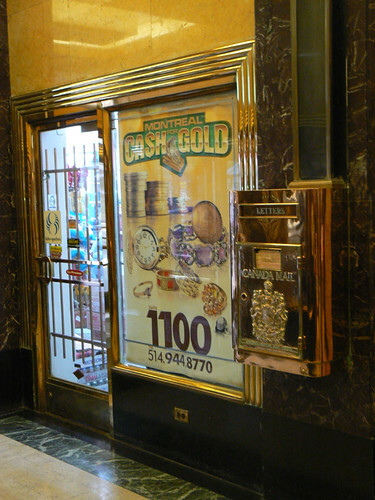 The Empress was designed by Montreal architect Alcide Chaussé with decoration by Emmanuel Briffa. It opened in 1927. 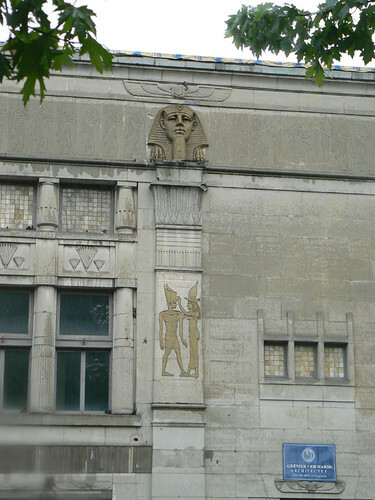 Briffa has created a facade made up of Egyptian motifs, reliefs and hierglyphics. Coming just 5 years after Howard Carter discovered the unplundered tomb of Tutankhamun Briffa has included a Pharoah's mask in the style of Tutankhamun although the feet appear to belong to the Sphinx rather than a Pharoah's mask. Above that is a winged sun disk, a common Egyptian symbol appropriated by many architects and designers of the period. 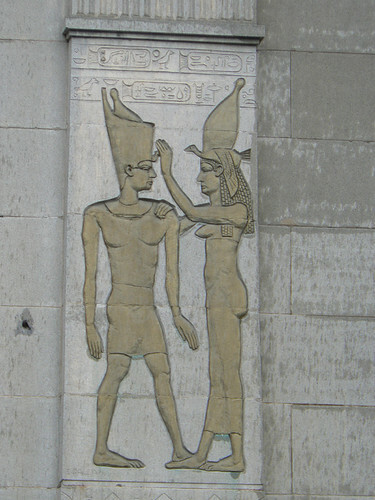 A common scene from Egyptian tombs is the Pharoah being blessed by a Goddess. 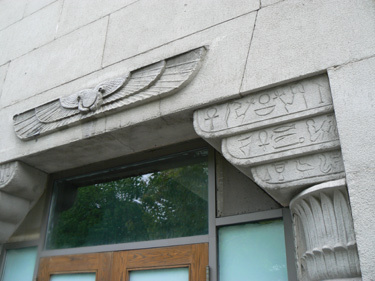 Briffa has included this on the facade of the Empress as well although I wouldn't vouch for the authencity if the hierglyphics. Too many cartouches for my liking. 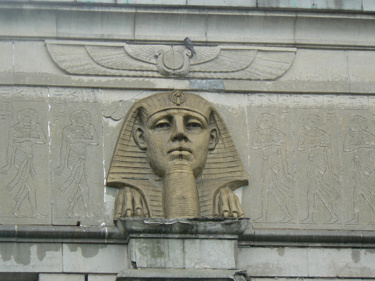 The Egyption decoration is continued at street level with doorways placed in Egyptian settings. The sun disk is placed directly above the entrance which is flanked by columns topped with stylised palm fronds. I like the Art Deco touch of the 'rule of three' stepped elements in the corner of the doorway decorated with hierglyphics. The Empress was locked up when I visited and I couldn't see any of the interior which was gutted by a fire in 1992. I doubt there is much left to see. The Empress Cultural Centre Inc are a charitable not-for-profit who are working to revitialise the old theatre as a multifunctional performing arts centre. I wish them luck and all the success in the world. Looking back at this picture of Namaqua House in Cape Town I am amazed at how the colourful the deco building is compared to the later buildings surrounding it. Even on this relatively dull day in 2003 the cream and coral colours stand out. Namaqua House was built in 1929 to a design by architects Roberts & Small. The top floor features a cantilevered balcony on each of the two face of the corner-sited building. 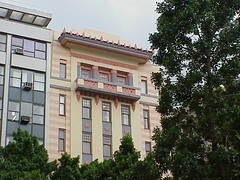 The Cape Town Art Deco Architecture Map indicates his is an early use of such cantilevered balconies. 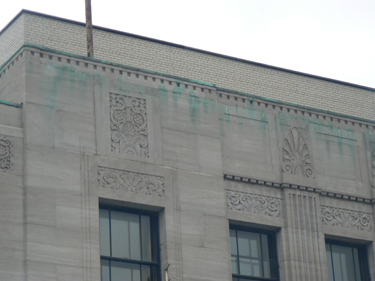 The balconies and corresponding sheltering canopies are the most decorated parts of the building. 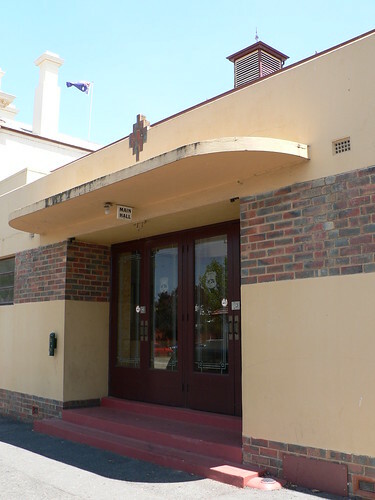 In 1939 a new streamline moderne entrance and an additional small hall were added to the side of the 1888 Maryborough Town Hall in central Victoria. The extension was designed by Melbourne architect Harry J Little. 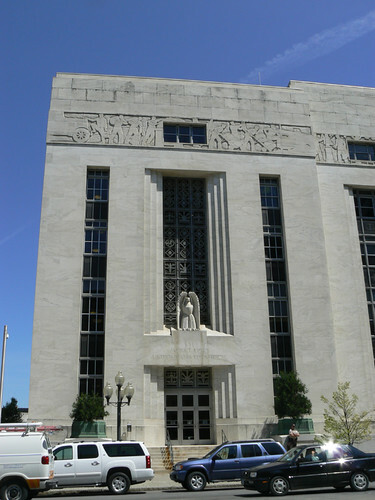 The James T Foley Courthouse in Albany, NY was built in 1933 and for over 60 years operated as both a courthouse and a post office. Today it just fulfills the function of courthouse. 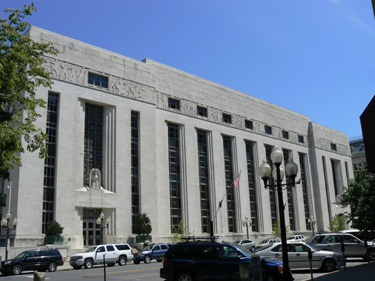 James Thomas Foley was appointed to the Federal Court by President Harry S Truman in 1949 and served as a judge until 1989 when he was 80 years old. The courthouse was renamed in his honour in 1989. He died in 1990. 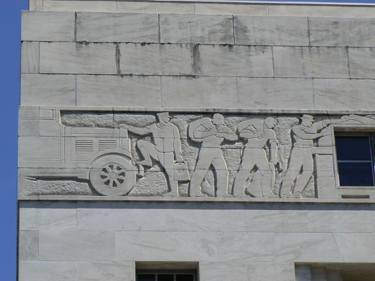 The postal service moved out of the building in 1995 but the frieze along the front shows various postal activities. 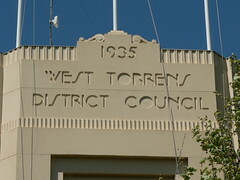 As you can see from the date on the West Torrens District Council offices in Adelaide they were built in 1935. The stylised lettering is typically deco and I especially like the letter 'S'. 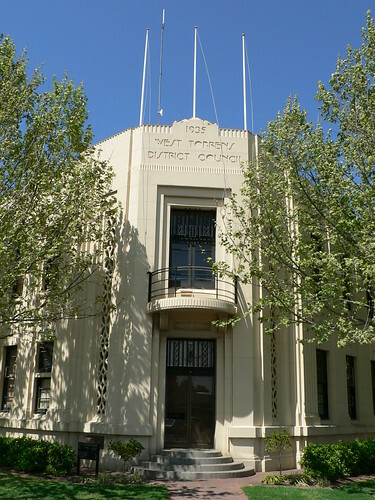 This building illustrates another Art Deco trait with the main entrance set into the corner of the building. The city of Napier, on the North Island of New Zealand, was severely damaged by an earthquake which struck the Hawkes Bay area on the morning of 3rd February 1931. 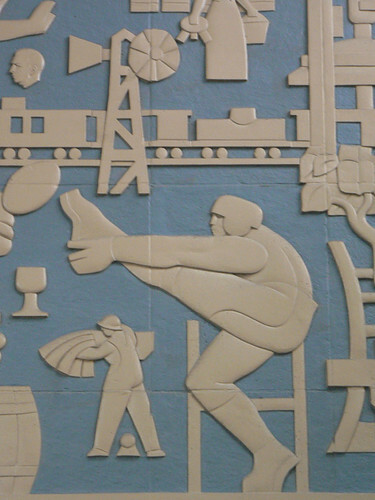 Within the next few years a lot of the city was rebuilt in the style of the day, Art Deco. 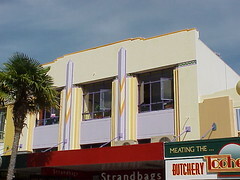 This is a typical shop in Napier that may not appear in any of the books but it shows how modest buildings in Napier took on the deco style. The colours are a bit Miami but in a seaside town, albeit in the Southern Hemisphere, they work. 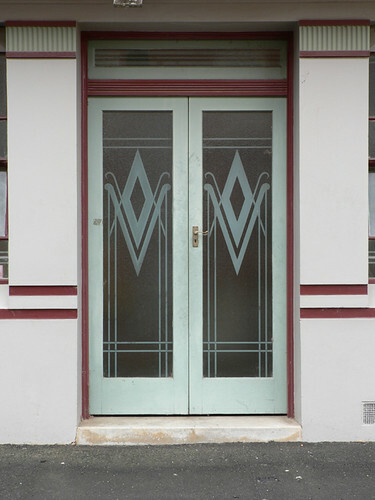 Each February an Art Deco Weekend is held in Napier. 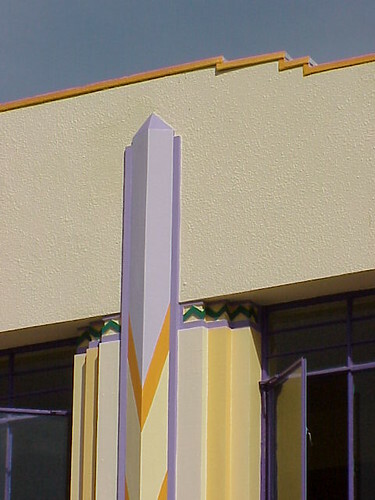 The programme for the 2010 event has been posted on the Napier Art Deco Trust website. 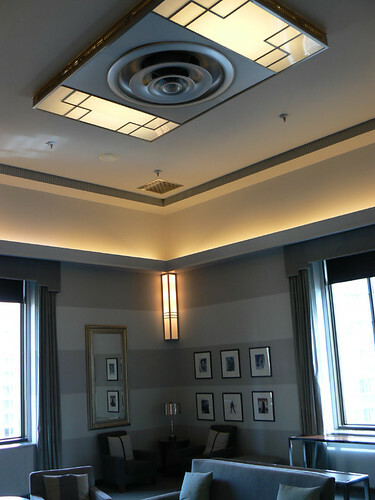 The highlight of Eaton's College Park store in Toronto was the Round Dining Room on the seventh floor. 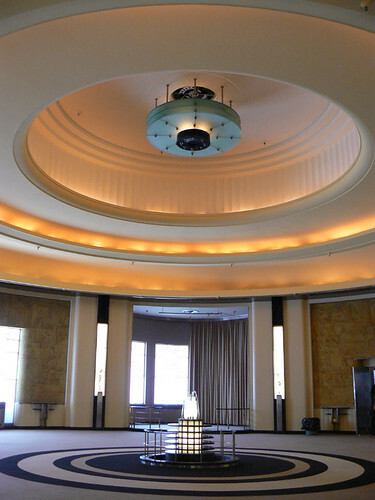 Now, the Round Room is the highlight of The Carlu which now occupies the seventh floor after a multi-million dollar restoration. 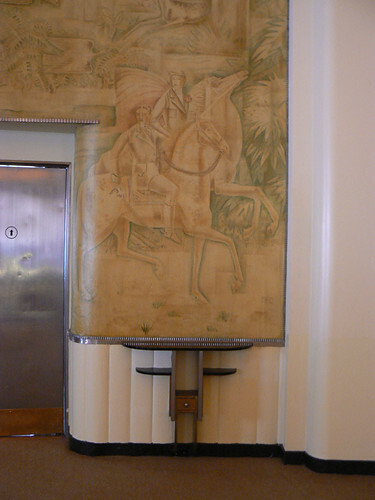 The room, like the rest of the seventh floor, was designed by Jacques Carlu and included large murals by his wife Natacha. At regular points around the room their are rounded alcoves that can be used as casual seating areas or small stage areas. 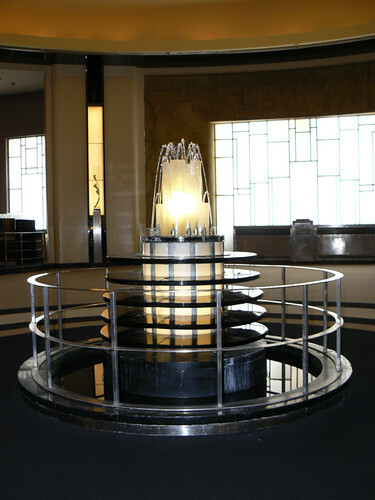 Literally, though, the centre of attention is the fountain in the middle of the room consisting of layers of Lalique glass. 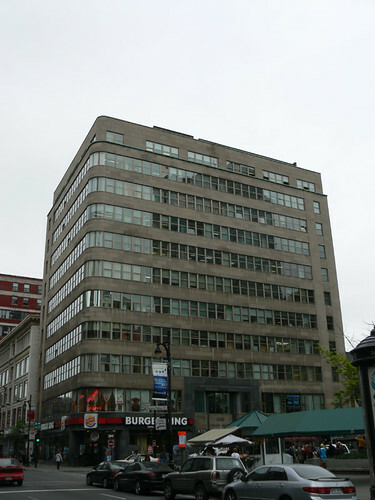 Towards the end of October 1930, Eaton's opened their College Park store in Toronto with the undoubted highlight of the building the seventh floor. 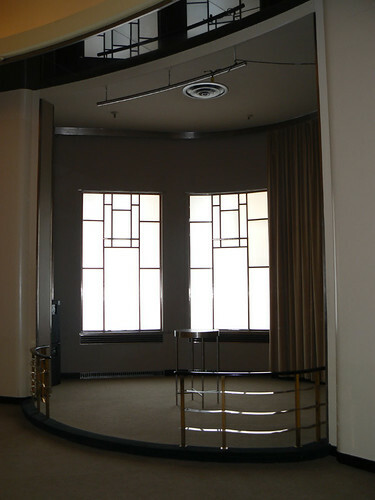 Lady Eaton commissioned French designer Jacques Carlu to design the seventh floor. Carlu had designed the interiors of the great ocean liners Normandie and Ile de France which were particular favourites of Lady Eaton. 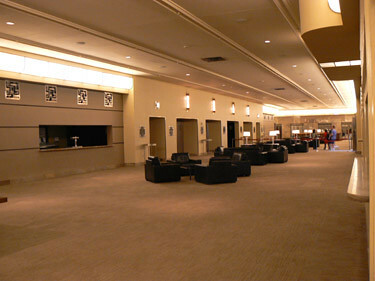 The seventh floor consisted of a huge lobby, circular dining room, an auditorium and a number of lounges and offices. By the mid 1970s, the taste for these spaces had declined. Eaton's had moved to a new retail complex closer to downtown and the fabulous seventh floor was sealed up. What remained, although damaged and compromised from the original design, was protected by its designation as a national Historic Site by the Supreme Court of Canada. The seventh floor remained empty for almost 30 years but after a multi-million dollar restoration it has emerged as The Carlu an Event Space like no other. 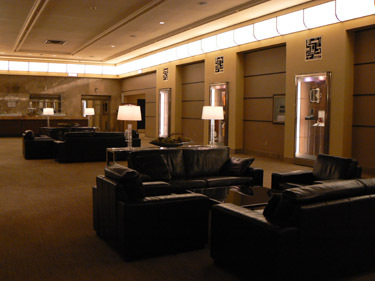 I was lucky to visit The Carlu as part of the Doors Open Toronto program in May 2009. 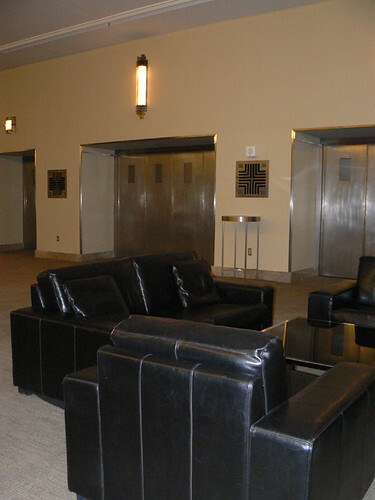 The three photos so far have been of the seventh floor lift lobby but this small office or lounge was also open for viewing. I don't know if this was added during the restoration or was part of the original design. I don't think that matters. 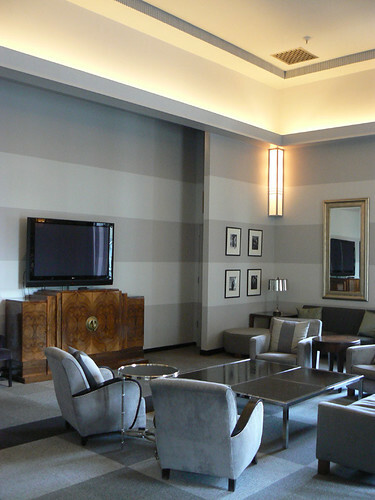 It is a fabulous space which leads through to the Round Room. I adore the front of this house in Camberwell. 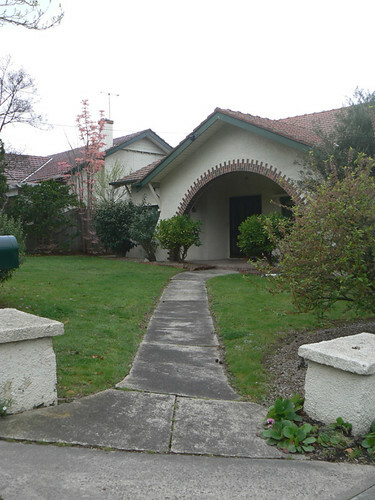 I don't know if it is a deep verandah or an enormous porch behind that complete semi-circular arch. On a hot November Saturday in Melbourne I look at this house and wonder if it is cool in there. 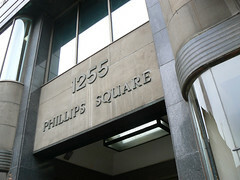 1255 Phillips Square in downtown Montreal was designed by Spence and Mathias and constructed in 1949. The overall design of the exterior is simple with streamline features. Curved stone walls and windows draw people towards the entrance. 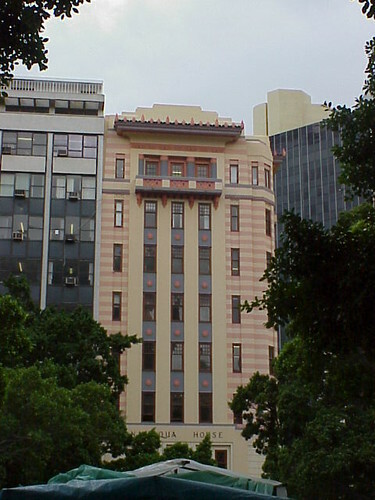 Horizontal bands of windows emphasise the streamline design as does the curved corner at the major street intersection. The high quality lobby is finished in cream, green and black colours with brass for the mailbox and the shop windows and doors. I was intrigued by this amazing building from the first time I saw it. The facade is rounded, in fact it is a completely circular building with a central core and roadway within the structure. The two storey high frame around the doorway is striking but in the end even that is dwarfed by the height of the monumental entrances either side of the administration block. 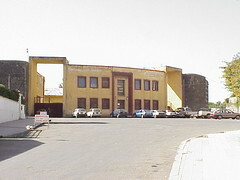 In Asmara - Africa's Secret Modernist City by Denison, Yu Ren and Gebremedhin the building is identified as originally being the Spinelli Store when it was built in the late 1930s. From their information it appears that Spinelli was a local businessman who owned a nearby villa. 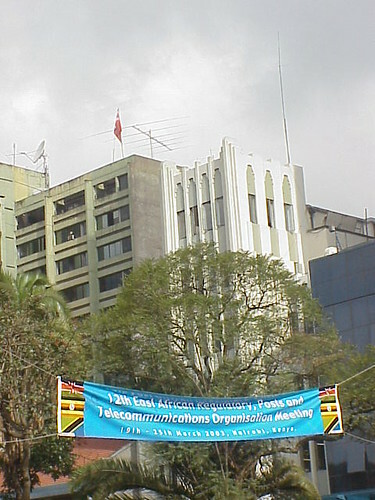 It is now the Africa Pension and that is where I stayed when I visited Asmara in 2003. 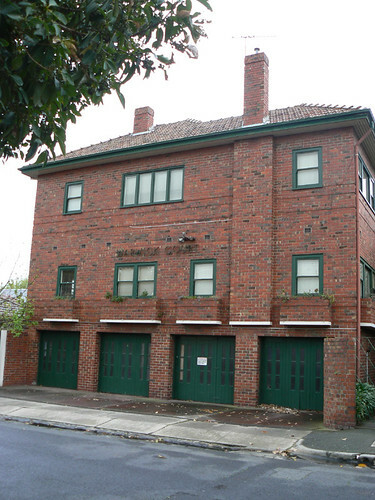 I absolutely love these four garages at Warwick Court in St Kilda East. 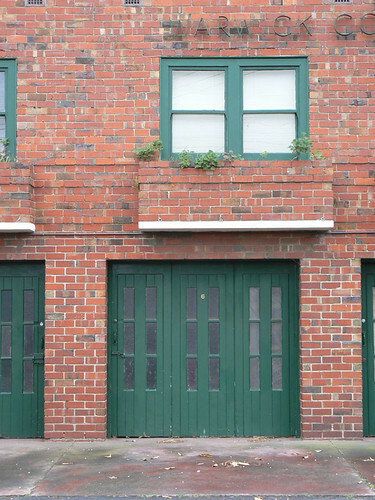 It is lovely to see the original doors still intact. I reckon I could just fit my car into one of the garages but I'm not sure I could open the car door to get out once I was in there.